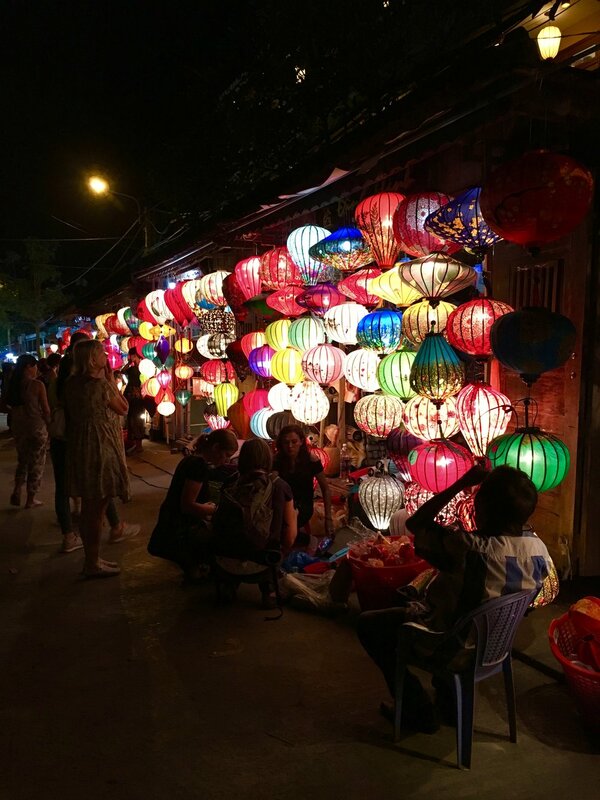 Hoi An, Vietnam Verdict: Overall we really loved Hoi An and would highly recommend a stop there if you are visiting Vietnam but would also recommend seeing another town or city as well to get more history! Where we stayed:Royal Hoi An M Gallery by Sofitel (breakfast included in our rate - definitely do this!). We booked via JetSetter, but they are on Expedia, etc. Overall, a great hotel, in a perfect location. The whole process was pretty easy and I can only speak for Da Nang but only took about 20 minutes. Yalyfor custom clothes. Hoi An is famous for this and there are many places to go but we loved our experience with Yaly. We worked with Elisa and Lynn. Good Morning Vietnam for Italian/Pizza. After a few days of south-east Asian cuisine, we needed a tiny break and this Italian joint served up super yummy ‘za. Banh Mi Phuongfor banh mi. This place has become famous after a stint on Anthony Bourdain’s No Reservations, and it's worth the occasional long line. We got the BBQ and the pork and beef, both were delicious. We had almost 3 full days (leaving later afternoon the final day) and spent most of the time wondering the ancient town. We discovered that we enjoyed that area much better during the day than at night, as night time gets a bit touristy. Day 1: We did one full day around town, heading right for Yaly after a fabulous breakfast al fresco at our hotel. We spent an hour or two with our ladies at Yaly designing our new clothes and then ventured off for a few hours to scour the town and get a belly full of pho. We came back to Yaly in the later afternoon for our first fitting - YES they actually make the clothes in half a day!!! That night we ate dinner at Orivy and got to bed early. Day 2: One day two we did a quick fitting in the AM (and yes ordered more clothes) and then grabbed a quick banh mi for an early lunch. Around 12:30 we left for our motorbike tour which went until about 5 pm. We had great weather, a little cool and cloudy but avoided the rain. That evening we did yet another fitting (these tailors are perfectionists if you have the time!) and then headed to dinner at Morning Glory. Day 3: On the final day we did last tidbits of shopping, tying up loose ends with our clothing, and grabbed a pizza for late lunch at Good Morning Vietnam before heading back to Da Nang for the airport. What stood out to me about Hoi An (the old town at least) was that there weren't any American brands (BK, McDonald's, KFC) and very few cars. If you stay in old town and mostly spend your time there you don't need anything except your two feet and maybe a free rental bicycle from the hotel. The streets are lined with shop after shop featuring handmade custom clothing, shoes, and any leather good you could dream of. Other shops featured art and still, some had those infamous elephant pants and "made in China" trinkets. One thing to note is that the streets slightly removed from the main drag seemed to be a little less crazy and had some great stuff as well. There were coffee shops galore and every 4 feet was a lady on the street serving com ga or little fruits. We never got sick from any food while there, we ate pho and banh me from local restaurants even chowing down all the fresh veggies (all the other tourists were doing it so we figured what the heck). The only thing on the trip I wish I'd had twice was the pho in Vietnam, it was light and citrusy and a perfect balance of subtle flavor and mouth-watering textures. Everything else is fairly heavy and sweet in that part of the world except this dish. IMHO anyways. I loved the colorful lantern-lined streets with the distinctly colonial orange yellow buildings, weathered from years of flooding but still holding firm in their place. The buzzing of motorbikes on day one becomes less alarming, even normal by day 3 as you learn to maneuver yourself around a town completely lacking in traffic signs. The people are kind but not overly smiley the way we found Cambodians to be. However, we only saw one tiny slice of Vietnam. Lastly, I loved our motorbike tour into the country but was disappointed in the lack of a history lesson. I was expecting to learn more but I held on tightly to the tidbits we were served sparsely. For instance, the fact that rice paddies hardly make people any money and are not easy crops to harvest... but people do it out of familial obligation, maybe even superstition, pride, you name it. But it sure isn't how they make their living. Regardless the bright green calf high grasses dotted with makeshift scarecrows (think sticks wearing a plastic poncho with as much grace as W had with one of those things at 45s inauguration) and middle aged folks donning traditional rice hats juxtaposed with billowing grey skies was a sight for sore eyes, and not to be missed if you're ever in Vietnam. Also check out our second stop in Cambodia, our third stop in Thailand, and our final stay in Hong Kong!